After allowing people to collaborate on documents, spreadsheets and presentations, Google Docs will support a new file type: PDF. Judging from Google's code, PDFs will have a distinct section and won't be imported as Google Docs documents. An icon for PDFs has been available for a while and when you visit http://docs.google.com/#pdfs, Google Docs informs you that there are no PDFs in the list of documents. Google has a pretty good PDF viewer in Google Book Search and Google Patent Search, so I expect to see some limited editing features added to the PDF viewer before repackaging it as a Google Docs application. Fortunately for Google, no other competing services provide a decent online PDF editor. "Since becoming one of the original Gmail and Google Docs users way back in the beta-beta days, it has been a continuing source of confusion and irritation to me that we STILL can't even upload PDFs to Google Docs. (...) For those of us with laptops and iPhones it would rock to offload as much as possible onto the web and having sharing capabilities with our clients and colleagues for ALL our docs, not just a select few. In the professional, business, and government communities, PDFs are the transmission document of choice," commented JAVA4DIVA in a thread from Google Docs group. Update: In less than a day, the feature has been added and you can now upload PDF files, share them and view them online. The PDF viewer is not very advanced, but you can use it to search inside a PDF file, select a block of text (Ctrl+C to copy the text) and go to a certain page. The next users will ask for is to be able to upload (and download)unchanged .doc , .xls and .ppt files, as well as loads of other files - including .exe files. In essence most users would like to use Google Docs as an on-line storage or even an Internet drive. Offering just .pdf won't please them on the long run. I keep getting PDF format is not supported. Save as HTML. PDF uploading has now come practically available in Google Docs. - The page opens with at the top the name of the PDF, beneath it a Download link, a Print link and a Share link. Beneath that, what seems like an error page that says: "Sorry, the page (or document) you have requested does not exist. Please check the address and try again." This error page obviously should not appear. 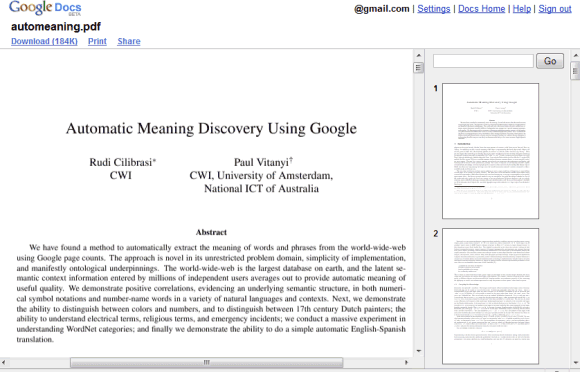 The PDF *can* be shared from the Google Docs files List. It works! I can now upload pdf's into Google Docs. You can't view them yet but it won't take them long to fix that. Google now provides all my online storage needs. I can abandon Skydrive and Omnidrive. Today i have upload some PDF files, but unfortunetly PDF not opening. its showing error "Sorry, the page (or document) you have requested does not exist." One benifit I see is also a link to pdf viewer in gmail... I really miss this feature. I have been using google docs since the very release. I love most of it. One feature I desperately miss, is online file storage where I could store all my PERSONAL data. It doesn't make much sense to have half of the data stored online, where the other half stays locally. This step is definite PLUS. however I expect more from this direction. (For now ignore the bottom half of the page that contains the error message). When you click on Download most (some :) browsers will give you the option to Open or Save the PDF; when using Open the PDF will show. The Google Docs team still has to tweak some links - the bottom half page probably should show the PDF in a viewer and the Share link still does not work (although sharing from the Google Docs files list is possible). Yup, you can now visualize, sharing is still working. Only 100 PDF files can be uploaded and stored on Google Docs. They can be 10 MB when uploaded from one's computer, but only 2 MB when uploaded directly by a URL. There is no option (yet?) to publish PDF files stored on Google Docs. It should be noted that the preview feature for PDF files in Google Docs can show only the first 100 pages of an uploaded PDF. So many limitations! I hope the 100 pages limitation will be removed as more resources are allocated to the PDF converters. I've been going paperless recently - scanning all of my paper documents to pdf and then shredding them. The one thing missing is a place online to upload them so that they're searchable by metadata. 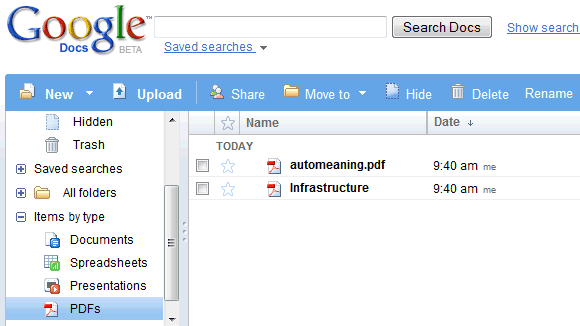 Google docs isn't quite there yet - it isn't indexing the pdf metadata for it's search. if you are looking to share / edit PDF files online. It hasn't any special service, just let you see the PDF in two sizes and move within the document. It shows images, something Google can't do. I use it for my work: i put the site in my favorites. So, any time i find any PDF in Google, i copy the URL and quickly paste it in PDF online. We can upload a file from our computer also, and view it online. It's specially good when you're in a different computer and it hasn't Adobe installed. There are many resources online, but only this let you see the file with images without registering. OK... If you only want to see the text, Google caché "(view in HTML)" is faster. It would be nice to have in Google Docs, PDF online presentations as they already have them for Powerpoint formats. So nearly there! I also am paperless, so would require a way to enable SSL transactions on GDs, metadata searching and possibly more than 100 pages in preview before I could being my archive online. Would be awesome if I could! An uploader for google docs that includes PDF files would be nice as well. If not that, the option to select more than 1 file in the integrated uploader would be nice. This is not an uploading problem, your pdf converter is doing something wrong. Waou !!!! And steel doesn't work on mac ....wonderfull !!!! I just found out about this and im really dissapointed. What good is if i can upload an up to 10mb pdf if i cant view it all? Limitation about sizes is OK, but pages? Doesnt make sense. when I upload my pdf documents to google docs, I just found out something when I search my documents information quickly. When I try to upload a PDF (1.2MB), I get an error message saying that files can't be >500K. I thought PDFs can be 10MB from your PC? My total space used is only 6MB, so that's not it. Any insight? I would love to see an option to open PDF directly in the google viewer when searching google. I feel one should be able to share the pdf files for viewing to anyone just like it is possible for doc. Not being able to publish it is a MAJOR downfall. I am very disappointed in this aspect! You can't publish PDF files yet. Is there any function to edit the PDF file i uploaded? I cant seem to find the function. No, you can't edit PDF files, but you can try one of these applications. Are you using Google Toolbar for Firefox? There's an option to open Word/Excel/Powerpoint/PDF files using Google Docs, but it's customizable. I cannot upload PDF files to GOOGLE DOCUMENTS !!! HELP !!! How come??? Information is very important! there is 100% assurance of uploading PDF into Google.Doc and even till date. You can as well upload into your your blog for others to share and read. Only if you can understand the procedures. If you're uploading PDF and it indicates an error in. It could be as a result of the version of the PDF or try to read the extension of the document (at the end of the document name) and ensure it reads i.e"xxxxxx.pdf"
Have you heard about PDF Studio, a cross-platform PDF editor to annotate and markup PDF documents? Starting at version 6.20 (currently available as beta version 6.20b), PDF Studio has full Google Docs integration and provides a powerful GUI to manage your Google Docs files to upload files or whole directories, manage your collections and share files with others without having to use Google Docs web interface. PDF files stored in your Google Docs account can be opened and edited directly in PDF Studio then saved back to Google Docs in a click. PDF Studio supports most PDF functions that Adobe Acrobat supports and works on Windows, Linux and Mac. Hi , I have come across a PDF book by Stephen Leather titled Private dancer. If I publish/attach it to my site am I not breaching copy write. Heeeelp? According to you, For sharing PDF file which one is better box dot net or google pdf? I am glad that Google finally provide this service as i am looking for alternative to scrib. Great share and a tutorial for me, thanks. Kriztian just switch to "classic view" and you'll be able to upload pdf files as usual. I do not understand how this works, can someone help with upload of pdf, or word docs. when to display the results on blogspot? Thanks for sharing on how to upload PDF in doc. I also got a better file sharing site you might be interested to choose for unlimited upload and sharing!